1772 The First Partition of Poland is made—between Austria, Prussia and Russia. Between 1772 and 1795 the entire territory of the Kingdom of Poland was divided between Prussia, Austria and Russia. During those so-called Partitions of Poland, Prussia acquired the western regions of Poland, esp. those, which were later renamed to West Prussia (formerly Royal Prussia) and Province of Posen (the area around Poznan, the Polish name being Wielkopolska, i.e. Greater Poland). The southern Polish territories around Krakow and Lwow were incorporated into the Austrian Empire and renamed "Galicia". The central and eastern provinces of Poland were taken over by the Russian Empire. 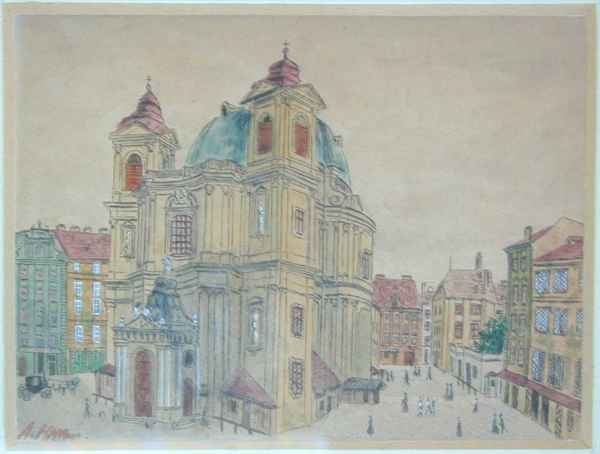 1910 Vienna: Street artist Adolf Hitler's complaint against Reinhold Hanisch goes to trial. Hitler swears out a statement for the court. On August 5, 1914, the German army launches its assault on the city of Liege in Belgium, violating the latter country's neutrality and beginning the first battle of World War I. 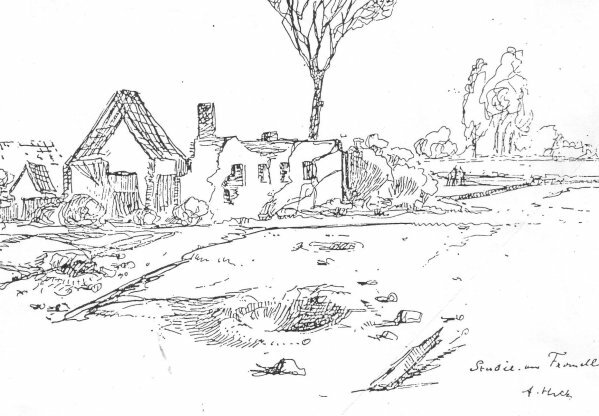 By August 4, the German 1st, 2nd and 3rd Armies—some 34 divisions of men—were in the process of aligning themselves on the right wing of the German lines, poised to move into Belgium. In total, seven German armies, with a total of 1.5 million soldiers, were being assembled along the Belgian and French frontiers, ready to put the long-held Schlieffen Plan—a sweeping advance through Belgium into France envisioned by former German Chief of Staff Alfred von Schlieffen—into practice. The 2nd Army, commanded by Field Marshal Karl von Bulow, was charged with taking the city of Liege, located at the gateway into Belgium from Germany. Built on a steep 500-foot slope rising up from the Meuse River, some 200 yards wide, and defended by 12 heavily armed forts—six on either side of the river, stretching along a 30-mile circumference—Liege was considered by many to be the most heavily fortified spot in Europe. Bulow's 2nd Army, numbering some 320,000 men, began its attack on Liege and its 35,000 garrison troops on August 5. Six brigades, commanded by General Otto von Emmich, were detached from the 2nd Army to form a special "Army of the Meuse" that would open the way for the rest of its comrades through Liege. Confident of an easy victory with little significant Belgian resistance, the Germans assumed Emmich's men could topple Liege while the rest of the German troops were still assembling. In fact, the Belgians put up a valiant defense from the first moment—a struggle led by their sovereign, King Albert, who had earlier urged his subjects to fight this threat to their neutrality and independence at all costs. 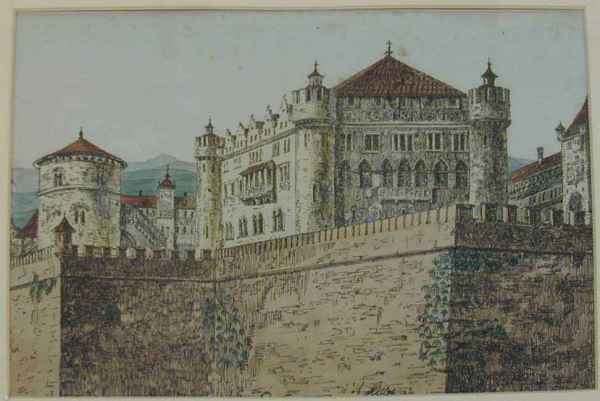 By the end of the day on August 5, all of Liege's 12 fortresses remained in Belgian hands. Liege eventually fell to the Germans on August 15, but only after they had brought up the most powerful land weapons in their arsenal, the enormous siege cannons. One type of cannon, built by the Austrian munitions firm Skoda, had a barrel measuring 12-inches (305mm); the other, manufactured by Krupps in Essen, Germany, was even more massive at 16.5 inches (420mm). Until that point, the largest guns had measured 13.5 inches and were used by the British navy; the largest on land had only measured 11 inches. 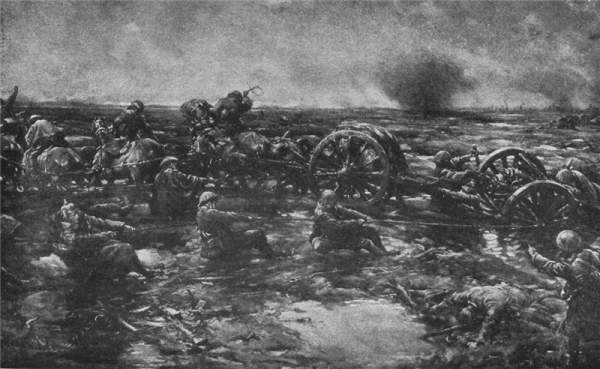 The heavy shelling of Liege began on August 12; on August 15, after taking 11 of Liege's 12 forts and exploding the walls of the 12th , Fort Loncin, with a shell, Emmich and his comrade Erich Ludendorff entered Loncin to find Liege's commander, General Gerard Mathieu Leman, alive but unconscious. Taken prisoner by the Germans, he later wrote to King Albert from Germany, "I would gladly have given my life, but Death would not have me." For their parts, Emmich and Ludendorff were awarded Germany's highest military medal, the Pour la Mérite cross, for their capture of Liege. On the first day of the war, a British ship dragged up Germany's transatlantic telegraph cables and cut them. From that time on, the Germans had to use radio links or telegrams sent through neutral nations, and both methods left them open to interception. As the Germans had advanced into Belgian and French territory where telegraph lines had been cut, it forced them to rely on wireless. The French and British, in contrast, only absolutely needed to use wireless to communicate with ships at sea. Montenegro declares war against Austria-Hungary. Poland: Gen. Max von Gallwitz's new German Twelfth Army captures Warsaw. War at Sea: The British navy defeats the Ottomans at a naval battle off Port Said, Egypt. Note: Though Egypt is not technically a participant in this war, several battles between the British and the Ottoman Turks will be fought on Egyptian soil. Though legally a vassal of the Ottomans, in reality, Egypt is under the control of the British, while also technically an independent nation with its own ruler, who was overthrown by the British at the beginning of the war due to his pro-German sympathies. Authorities in Hamburg order the removal of the Heinrich Heine monument: In 1834, 99 years before Hitler and the Nazis rose to power, Heine warned: "A drama will be enacted in Germany compared to which the French Revolution will seem harmless and carefree. Christianity restrained the martial ardor for a time but it did not destroy it; once the restraining talisman [the cross] is shattered, savagery will rise again." As his work at the seminary progressed, Bonhoeffer attempted to retain his teaching post at the University of Berlin and did so until August 5, 1936, when it was withdrawn because of his opposition to Hitler's innovations in the church. His imperturbability was expressed in his comment, "I have long ceased to believe in the University." 1938 Antisemitism: Poland: New laws regulating the meat and cattle industry in Poland virtually eliminate Jews from participation. Barbarossa: The first operational plan for the German invasion of the Soviet Union is presented to General Halder, Chief of Staff of the Military High Command. In Mein Kampf and in numerous speeches Adolf Hitler claimed that the German population needed more living space. Hitler's Lebensraum policy was mainly directed at the Soviet Union. He was especially interested in the Ukraine where he planned to develop a German colony. The system would be based on the British occupation of India: "What India was for England the territories of Russia will be for us . . . . The German colonists ought to live on handsome, spacious farms. The German services will be lodged in marvellous buildings, the governors in palaces . . . . The Germans—this is essential—will have to constitute amongst themselves a closed society, like a fortress. The least of our stable-lads will be superior to any native. With the signing of the Polish-British Military Agreement in early August 1940 the formation of the Polish Air Force under RAF operational control was permitted. These airmen-pilots, air crews and ground staffs made important military contributions to the Allied air effort particularly during the Battle of Britain where two Polish fighter squadrons—302 and 303—and Polish pilots serving in numerous other RAF fighter squadrons particularly distinguished themselves, but also in other air operations. Polish bomber crews, many operating from bases in Lincolnshire, participated in the bombing offensive on Germany, taking heavy casualties in this long and dangerous battle. Among other operations the Polish Air Force provided aerial cover in the 1942 Dieppe landings, participated in the Air Defence of Great Britain, took part in operations in North Africa, the Normandy invasion and Northern Europe, Italy and help for the Polish Home Army and the Warsaw Uprising in 1944. Polish aircrews were also engaged in anti-submarine patrols and convoy duties. Polish pilots and crew also served in Ferry Command later abosorbed by Transport Command, the Atlantic Ferry Organization (ATFERO), (Prestwick was a major trans-Atlantic ferry base through which thousands of North American built aircraft arrived) and the Air Transport Auxiliary (ATA) - and technical ground staffs in RAF units. Independent Latvia was governed by democratic coalitions until 1934, when authocratic rule was established by President Karlis Ulmanis. In 1939 Latvia was forced to grant military bases on its soil to the Soviet Union, and in 1940 the Soviet Red Army moved into Latvia, which was soon incorporated into the Soviet Union. Nazi Germany held Latvia from 1941 to 1944, when it was retaken by the Red Army. Latvia's farms were forcibly collectivized in 1949, and its flourishing economy was integrated into that of the Soviet Union. Latvia remained one of the most prosperous and highly industrialized parts of the Soviet Union, however, and its people retained strong memories of their brief 20-year period of independence. With the liberalization of the Soviet regime undertaken by Mikhail Gorbachev in the late 1980s, Latvians began seeking Latvia declared restoration of its independence on May, 1990 and attained full independence from the Soviet Union in August 21, 1991. 1941 World War II: Barbarossa: The German army takes 410,000 Russian prisoners in Uman and Smolensk pockets in the Soviet Union. Knowledge has come to me which I feel is authentic that the Government of Japan has decided not to undertake military operations against the Union of Soviet Socialist Republics at this time. This, I believe, means postponement of any attack on Siberia until spring of next year. Referring to Item 4 of the above-mentioned order, I order that all young female prisoners capable of work are to be sent to Germany for work, through the agency of Reich Commissioner Sauckel. Children, old women, and old men are to be collected and put to work in the women's and children's camps established by me on estates, as well as on the border of the evacuated area. In Sicily, Mafiosi acting on the advice of American contacts cooperated with American forces after the landings, but their efforts did little to aid the invasion itself. Indeed, that was unnecessary; the poor condition and morale of Italian troops had been proven in Africa and elsewhere, and Allied armies needed no internal coercion to encourage such troops to surrender. Moreover, Allied intelligence was already efficient, and aerial bombardments had softened many targets while demoralizing the population. None of this was owed to the Mafia, many exponents of which were in prison—where they perhaps should have remained. Calogero Vizzini and others provided additional intelligence and identified friendly parties (Mafiosi) imprisoned in Sicily as opponents to the Fascist regime. (It was easy for the Mafiosi to pose as anti-Fascists.) These individuals were promptly released. A number of key Mafiosi assisted the Allies in administration during the occupation and several were appointed to replace Fascist mayors of Sicilian towns. This paints a complex picture of collaboration, but nothing like the colorful escapades described by some authors. After his return from the final meeting with Hitler (Rastenburg, August 5-6, 1944), Marshal Ion Antonescu declared to Turkey's chargé d'affaires that it was neither possible, nor in Romania's interest to try to detach itself from Germany. Marshal's convinction was determined by the intensity and the violence of the Germans' reaction when in Warsaw the inssurection started on August 1, 1944. The pictures showed by Hitler gave him—as himself recognized in face of the Turkish representative—a horrible feeling. The Romanian state's leader didn't believe that in the given circumstances Romania could have tried a detachment from Germany, without suffering consequences as terrible as those that were developing in Warsaw, where the German reaction was further going on. I have received your message about Warsaw. I think that the information which has been communicated to you by the Poles is greatly exaggerated and does not inspire confidence. One could reach that conclusion even from the fact that the Polish emigrants have already claimed for themselves that they all but captured Vilna with a few stray units of the Home Army, and even announced that on the radio. But that of course does not in any way correspond to the facts. The Home Army of the Poles consists of a few detachments which they incorrectly call divisions. They have neither artillery nor aircraft nor tanks. I cannot imagine how such detachments can capture Warsaw, for the defense of which the Germans have produced four tank divisions, among them the Hermann Goering Division. On this day in 1944, Polish insurgents liberate a German forced-labor camp in Warsaw, freeing 348 Jewish prisoners, who join in a general uprising against the German occupiers of the city. As the Red Army advanced on Warsaw in July, Polish patriots, still loyal to their government-in-exile back in London, prepared to overthrow their German occupiers. On July 29, the Polish Home Army (underground), the People's Army (a communist guerilla movement), and armed civilians took back two-thirds of Warsaw from the Germans. On August 4, the Germans counterattacked, mowing down Polish civilians with machine-gun fire. By August 5, more than 15,000 Poles were dead. The Polish command cried to the Allies for help. Churchill telegraphed Stalin, informing him that the British intended to drop ammunition and other supplies into the southwest quarter of Warsaw to aid the insurgents. The prime minister asked Stalin to aid in the insurgents' cause. Stalin balked, claiming the insurgency was too insignificant to waste time with. Britain succeeded to getting some aid to the Polish patriots, but the Germans also succeeded-in dropping incendiary bombs. The Poles fought on, and on August 5 they freed Jewish forced laborers who then joined in the battle, some of whom formed a special platoon dedicated solely to repairing captured German tanks for use in the struggle. Cowra breakout: Possibly the biggest prison breakout in history occurs as 545 Japanese POWs attempt to escape outside the town of Cowra, NSW, Australia. At about 2 AM a Japanese ran to the camp gates and shouted what seemed to be a warning to the sentries. Then a Japanese bugle sounded. A sentry fired a warning shot. More sentries fired as three mobs of prisoners, shouting "Banzai", began breaking through the wire, one mob on the northern side, one on the western and one on the southern. They flung themselves across the wire with the help of blankets. They were armed with knives, baseball bats, clubs studded with nails and hooks, wire stilettos and garotting cords. Most were killed but many escape and later commit suicide. Five Australian guards also die. 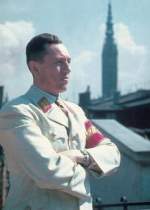 At the beginning of March 1945 the Gauleiter and Reich Defense Commissioner Giesler in Munich ordered me to come to him, and made the monstrous request that I should use my influence with the commander of Dachau that at the approach of the American troops the prisoners—there were 25,000 people there at the time—were to be shot. I refused this demand with indignation, and I pointed out that I could not give any orders to the commander, whereupon Giesler said to me that he, as Reich Defense Commissioner, would see to it that the camp would be bombed to bits by our own forces. I told him that I considered it impossible that any German Air Force commander would be willing to do this. Then Giesler said he would see to it that something would be put into the soup of the prisoners. That is, he threatened to poison them. 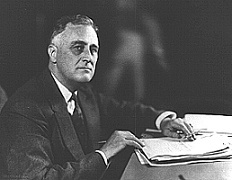 As danger seemed imminent, I sent a teletype inquiry to the Inspector of Concentration Camps and asked on my own initiative for a speedy decision by Himmler as to what was to be done with the prisoners in case the American troops approached. Shortly afterward the news came that the camps were to be surrendered as a whole to the enemy. I showed that to Giesler. He was very indignant because I had frustrated his plans and because I was of a different opinion. Shortly afterward we had another clash regarding the defense of Munich, which was completely hopeless. The Armed Forces commander was fired 8 days before me, and on 20 April I was also dismissed and all my offices were taken away from me and I was without power. Dr. Horst Pelckmann (Co-counsel for the SS): Is it correct that Himmler once said that the successes of the Waffen-SS were to be credited to terroristic measures? Paul Hauser: Heinrich Himmler once used this expression in a speech. I reported to him ' that it was completely wrong, that we had not gained our successes through terror methods but only through the courage of officers and men who were ready to sacrifice themselves to the last man if necessity arose. Dr. Pelckmann: What basic principles were applied by the troop for the treatment of prisoners of war? Paul Hauser: The prisoners of war were treated according to the rules which applied in the Army, that is to say, that the billeting, the food, and the medical attention were just like in the Army. I myself, while lying wounded in different field hospitals, noticed that friend and foe were treated alike, and the old manner of dealing with prisoners was applied. 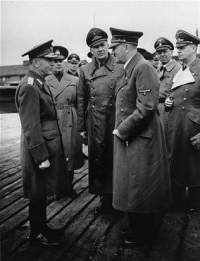 Dr. Pelckmann: Did these principles suffer any change by the naming of Himmler to the rank of commander-in-chief of the replacement army and thereby simultaneously to chief of the Prisoners of War Organization? Paul Hauser: Not with regard to the Waffen-SS. But in his capacity as commander-in-chief of the replacement army Heinrich Himmler was also given authority over the Prisoners of War Organization, and he decreed that the Higher SS and Police Leaders at home be charged with the supervision of the security measures of the prisoner-of-war camps. I do not know the details however. I can only state that thereupon the Higher SS and Police Leaders were made generals of the Waffen-SS. Dr. Pelckmann: The Prosecution asserts that the Waffen—SS, because of their will to destroy, committed Crimes against Humanity and crimes against the laws of war in the occupied coun-tries and arbitrarily destroyed cities and villages. Did the Waffen—SS participate in those measures? Paul Hauser: I had occasion to see these troops in many theaters of war. I lived with the population in the East and West. The rela-tionship was always a good one. It was based on mutual aid and assistance. Where we had to call upon the population for work, for instance, in road building, they received food for their services. The arbitrary destruction of villages would only have made it more difficult for us to get accommodations. I do not remember a single case in which the front troops of my division had ever taken hostages or destroyed villages as a punishment. Dr. Pelckmann: : Before the Eastern campaign, had you known of a decree of Hitler's which allegedly said that excesses of the troops toward the civilian population were not to be punished? Paul Hauser: That was not the wording of the order. Rather, it left the decision as to whether the troops, in their excesses toward the civilian population were legally to be prosecuted by the court itself, whereas formerly the court was under obligation to prosecute. 1946 Death: Wilhelm Marx: German Catholic politician and a member of the Centre Party. As student he became a member of K.St.V. Arminia. He served as Chancellor of Germany from 1923 to 1925 and again from 1926 to 1928, and was the Centre Party's (and, in the second round, the entire Weimar Coalition's) candidate in the 1925 presidential election, when he was defeated by Paul von Hindenburg. German chemist; won the 1927 Nobel Prize in Chemistry for his research into the bile acids. Wieland tried successfully to protect people, especially Jewish students, who were "racially burdened" after the Nuremberg Laws. Students who were expelled because they were "racially burdened" could stay in Heinrich Wieland's group as chemists or as "Gaeste des Geheimrats" (guests of the privy councillor).